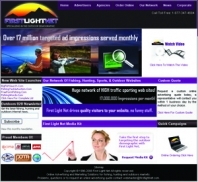 First Light Net (www.firstlightnet.com) offers internet advertising solutions to the fishing, hunting, sports, and outdoors markets that increase your sales and brand awareness. We have been building, acquiring and managing our network of over 400 fishing, hunting and outdoors websites since 1996. Our network reaches over 1 million unique monthly visitors and serves as much as 30 million ads monthly to the outdoorsmen worldwide. First Light Net is a Trademark of Predatorial Advertising Associated L.L.C. We have created a bridge for all outdoor companies looking to aggressively increase their internet presence. We own the largest fishing network on the internet and have expanded our demographics to the hunting, outdoors and select sports markets. We offer advertising solutions on our network of over 350 websites reaching over 1.6 million outdoor enthusiasts and serving over 30 million ads per month. Our client driven team will create a cost effective branding strategy for your products, services or brand by promoting them throughout our network, resulting in increased return on investment and ultimate targeting.